Inga Gentzel was one of the two first Swedish women to win Olympic Games medals in athletics in 1928. Inga Gentzel was born in Stockholm in 1908. She was the daughter of Karl Alfred and Hildur Gentzel, and she had four siblings. Inga Gentzel became involved in sports purely by chance when she was 18 years old. During a visit to a sports field in the spring of 1926 she entered a ‘try it out’ race in which she ran barefoot and won. Shortly thereafter she joined Djurgårdens IF. The organisation immediately registered her for the selection races being held for the impending Internationella Kvinnliga Idrottspelen (international women’s games) in Gothenburg. She chose a distance of 1000 meters and won, with a time which became an unofficial Swedish record. The Gothenburg competitions, which are sometimes incorrectly known as ‘Den andra damolympiaden’ (the second ladies’ Olympiad), were held at the end of August. Inga Gentzel came 2nd in the 1000 metre distance with a time which was almost 20 seconds faster than her previous recorded time. Over the course of a few months a new star had emerged. Inga Gentzel was the Swedish champion of the 800 meter distance at the first unofficial Swedish Championships (SM) in 1927, and at the official championships held in the period 1928 to 1931, as well as in the 200 meter distance in 1929. Her best performance was at the 1928 Amsterdam Olympic Games. These games included women’s athletics for the first time ever, in five events, one of which was the 800 meter distance. In June 1928 Inga Gentzel set the world record for that distance with a time of 2:20.4 in a race in Stockholm. She was roundly hailed by the press not just for her time but also for her beautiful running style. Despite her and other female competitors’ successful performances the Swedish Olympic committee (SOK) decided not to cover the expenses they would incur by competing at the Games. This decision led to an intense debate and a special fundraising effort for the women concerned. The SOK then conceded and Inga Gentzel and several others were given the all-clear to travel to Amsterdam. Inga Gentzel easily qualified in her heat for the Olympic 800 meter finals. She achieved 3rd place, winning the bronze medal, just three days after  (Ruth Svedberg) had also won a bronze for her discus competition. It has been claimed that Inga Gentzel lacked tactics in her running plan. She often began her runs at a very fast pace and was thus unable to deliver a speedy finish. This is exactly what happened at the Olympic final. She quickly joined the lead pack and stayed there until the last 100 meters, at which point she was passed by both the German Batschauer-Radke and the Japanese Hitomi. All three runners beat the current world record. Inga Gentzel’s new Swedish record of 2:17.8 remained in place for 15 years until  (Anna Larsson) bested it in 1943. In the film Inga Gentzel, en sjungande idrottsstjärna, Inga Gentzel herself said that her tactics were intentionally chosen because she had stamina but lacked an ability to sprint. According to Lena Enberg’s article on Inga Gentzel in Djurgårdens 100-årshistorik, the athlete’s bronze medal should actually have been a silver medal. Enberg claimed that subsequently the silver medallist, Kinuye Hitomi, was revealed to be a man. However, Enberg does not provide evidence for this claim and so it must remain questionable. Inga Gentzel also competed in racewalking and orienteering. She served for a number of years as chair of Djurgårdens IF women’s section from 1938 onwards, even though she had been resident in Nyköping since 1937. Inga Gentzel appears to have ceased serious sporting activity a few years into the 1930s as a result of injuries. She then seems to have developed a greater interest in music. She was indeed very musical, an aptitude she had had since childhood, given that her father was a musician. Music also informed her siblings’ choices in careers. Inga Gentzel became a piano-teacher in Nyköping. Along with her sister ‘Ulla’ Castegren and Anna-Lisa Cronström Inga Gentzel set up the Trio Rita singing group, and they were often heard on the radio, including on Sven Jerring’s entertainment programme. The group mainly served as backing choir to solo singers and made several recordings in the early 1930s. In 1937 Inga Gentzel married Nilsfolke Dahlberg, a civil engineer. The couple had four children. 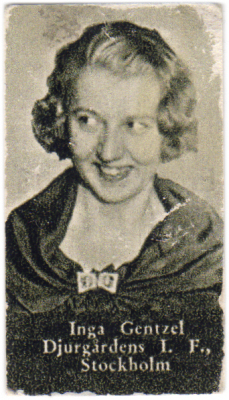 Inga Gentzel died in Nyköping in 1991. Inga Kristina Gentzel, www.skbl.se/sv/artikel/IngaGentzel, Svenskt kvinnobiografiskt lexikon (article by Lennart K Persson), retrieved 2019-04-20.